I seem to be on a Canal Rocks theme at the moment. It is the closest part of the coast to where I live and I can duck down there in a few minutes, so it becomes the choice when I make a last minute decision to go out. This was taken Friday evening, just after the sun had set. About 5 minutes after the sun sank behind the rocks the sky came alive. This lasted for about 3 minutes. Ideally I would like to have been a couple of metres to the right, but I would get very wet if I tried! The title of the post relates to the fact that the water under the bridge is always moving, even on the calmest of days. This entry was posted on April 10, 2011 by ianwiese. 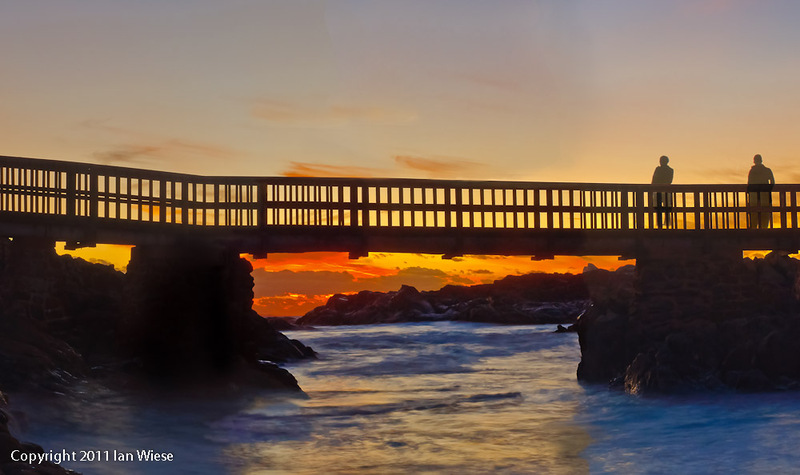 It was filed under Landscape and was tagged with bridge, Canal Rocks, movement, sunset, water.